Try and image what has stopped Granny and the villagers in their tracks and piece together what they can see in this Holdson Wasgij 20th Anniversary 1000pc puzzle. 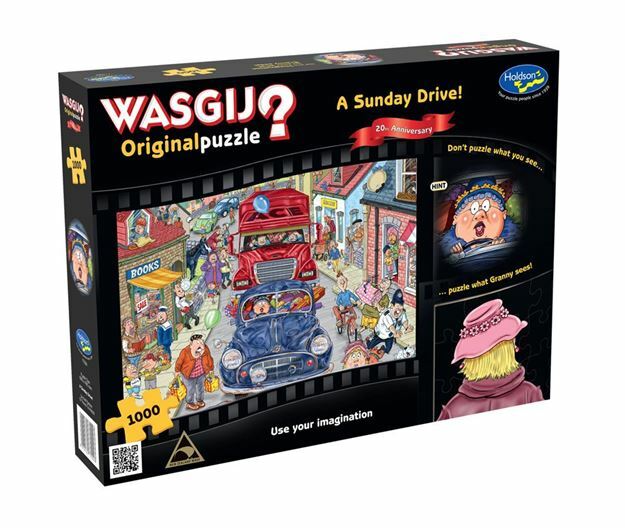 This release is based on the very first Wasgij puzzle, but with a twist! After 20 years, Granny has returned to the village she visited on her Sunday Drive. Granny hasn't changed much, and neither has her car, but the village certainly has - more shops, more houses adn a lot more people! But something has stopped Granny in her tracks - has she seen a familiar face or two in the street ahead? The puzzle holds the answer! The picture on the box lid is not the puzzle; it is simply a clue to what the puzzle is! Age 8+ years. Made in New Zealand by Holdson. Approximate puzzle dimensions: 688mm x 493mm. Box size: 270mm x 370mm.